Blogging a little at a time! : Happy Thanksgiving!! Happy Thanksgiving To All!! We had a great Thanksgiving, ate a lot food and will probably keep eating some more! We did however miss our families this holiday, since we live far away, but we are hoping to see them soon. I know, I know I haven't blogged in about a month, things have been crazy around here. But I have had a chance to catch up on some of my scrapbooking. 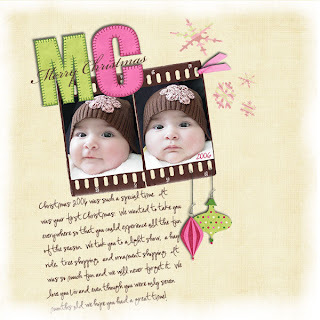 I have also joined two digital scrapbooking creative teams. They are excellent designers so you should really go and check out their shops. Now that Thanksgiving is almost over, Christmas is just around the corner. And to get you into the Christmas Spirit here is a Layout I made using a combination of two of Cori's latest kits, Funky Christmas and Homespun Holiday. I hope all is well with everyone. Enjoy the time with family!